Calling all science clubbers! Are you ready for another all-out experience? 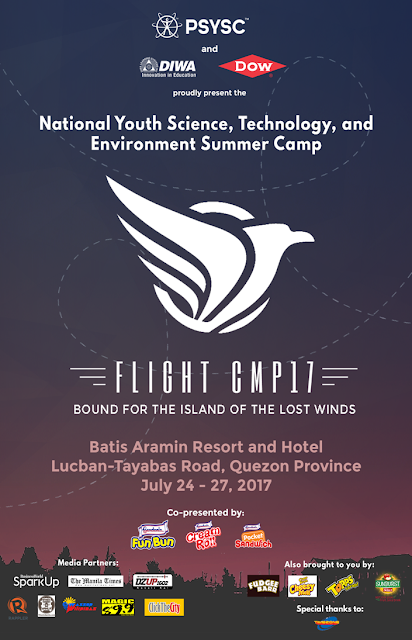 Fasten your seatbelts as the National Youth Science, Technology, and Environment Summer Camp (NYSTESC) 2017 takes off this July 24-27, 2017, at Batis Aramin Resort and Hotel, Tayabas Road, Lucban, Quezon! Once again, the Philippine Society of Youth Science Clubs (PSYSC) is bringing you the most sought-after science camp for high school students and teachers in the country. With this year’s theme, "Flight CMP17: Bound for the Island of the Lost Winds", we are ready to bring you to a camp that will surely go beyond the limits of your expectations. Get to explore the science of aerodynamics as we tackle wind energy conversion, transportation, animal aviation, and weather forecasting. Through our esteemed guest lecturers, various workshops and competitions, seminar and congress, this camp shall fill up our hearts and minds with truly good memories. But, wait! The fun doesn’t stop there! Be fascinated by the beauty of Quezon as we also take you to some of its wonders! This event will surely be one of your 2017 highlights! So, what are you waiting for? Pack up and join us aboard this flight! Be part of the science clubbing movement as we keep its fire burning! Affiliate with PSYSC today as they offer a totally new science clubbing experience! The Philippine Society of Youth Science Clubs (PSYSC) is the premier non-profit organization that promotes the public understanding of Science, Technology, and Environment in the country. For 46 years, PSYSC has been upholding its values and thrust, enabling the Filipino youth in taking action in the fields of science and technology in pursuit of national progress. For more information, feel free to contact the Philippine Society of Youth Science Clubs at (02) 332-8151 or send them a message through mail@psysc.org. You may also visit them at www.psysc.org or like their official Facebook page at www.facebook.com psysc.nystesc.